Player Awards - ST ANDREWS BERWICK RANGERS SUPPORTERS. "We are now in a positon that we can present an award to a player at the end of the season. The Award we have chosen is for "outstanding Performance". This can give us scope to present a player with an award for a individual game, good goal or season long performance. If something catches our eye during the season it will be a contender. 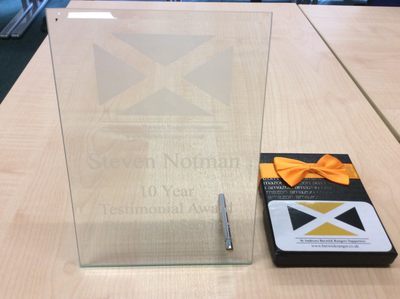 The current standard of award will be a engraved glass plaque and a Amazon gift voucher. 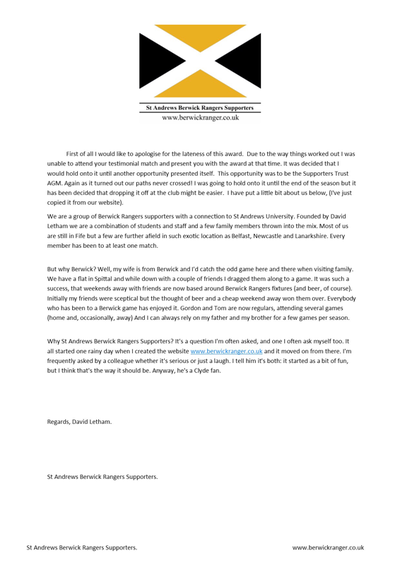 The award will be presented at the end of season awards ceremony at Berwick Rangers Football Club." - David Letham. season 2016/17 winner Sean Brennan.